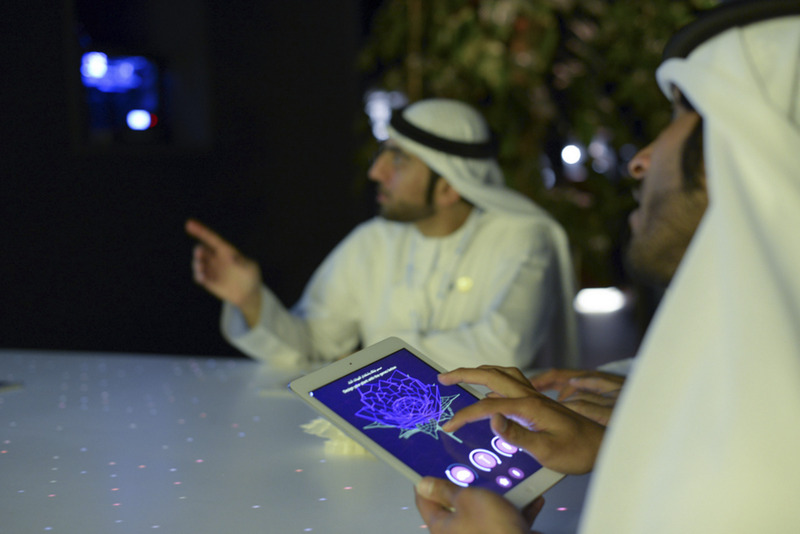 The Museum of Future Government Services exhibition was created to both inspire and forecast the future of government in the UAE, the surrounding countries, and beyond. Through the experiences designed by Tellart, it exposed thousands of high-level government officials to concepts of future government and emerging technologies. The United Arab Emirates has demonstrated an aggressive attitude towards modernization. Since the country was constituted in 1971, its rate of change has been enormous – driven by a fast growing economy, it has quickly and confidently emerged as a global business center and a gateway to the Middle East and Africa. The UAE's public policies and government services have been an essential part of this rise, and the UAE Prime Minister's Office is committed to continual innovation in technology-driven and consumer-centric services that aim to better the lives of its citizens. Forward-thinking policies are made possible by clear and convincing communication of a vision for the future–a job that is often left to films, graphics, or paper-based media when visionaries try to communicate with stakeholders. 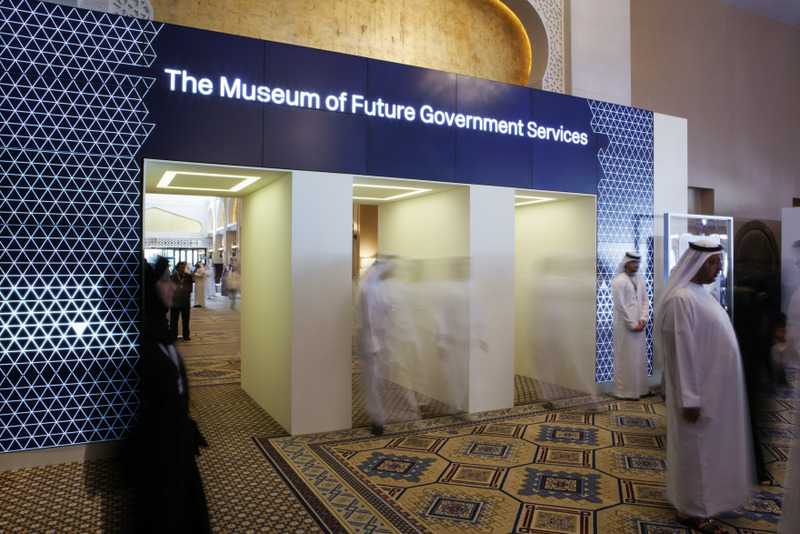 The Museum of Future Government Services, created for the UAE Prime Minister's Office and launched in Dubai in February 2014, was a new mode of communication for impacting policy-makers and driving innovation. Rather than utilizing traditional materials, we created the world's largest "design futures" exhibition to date. This more direct experience of future scenarios, in the form of working prototypes of fictional future services that participants could interact with and experience for themselves, was able to reach a larger audience and convey more complex aesthetic and emotional nuance. 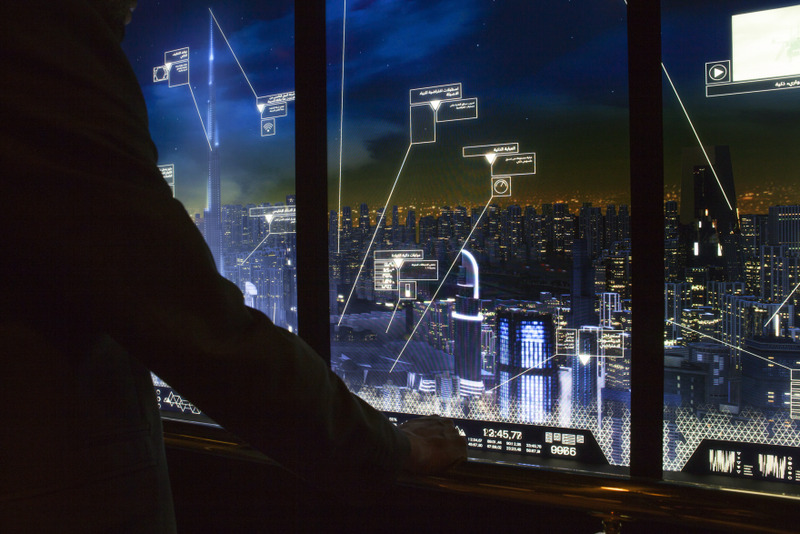 Our approach was to design a theatrical, immersive experience, with large-scale interactive digital exhibits and industrial- and product-design "artifacts of the future." The Museum was structured as a series of distinct spaces that each explored the future of key government service areas: Future of International Travel, Future of Healthcare, Future of Education, The Smart City and Digital Public Services. The effect was powerful, garnering significant international media attention and leading to a national conversation about the role of big data, automation, robotics, and personal genetics. Over 3,500 senior government officials from around the world took part in the exhibition, including the entire UAE Cabinet, ministers from multiple countries (including the UK Cabinet Minister Francis Maude), and a large number of CEOs and academics (including Professor Jeffrey Sachs, Sir Richard Branson, and others). Several policy initiatives were launched as a direct result, including the world's first and largest international award for using drones in civilian government services (which has received over 2.6 million views on YouTube). Tellart was lead exhibition designer, and worked in partnership with Fabrica (Benetton's communications research centre) to design and execute the Museum. The research and future foresight organization, Institute for the Future, and design research consultancies Superflux and Near Future Laboratory, were engaged to assist with the research and conception stage of the portrayed future government services. Bespoke furniture was created by Atelier F.
Tellart Museum of Future Government Services The Museum was part of the 2014 Government Summit in Dubai. Tellart Museum Signage The Museum's signage, static and dynamic, was designed for both English and Arabic. Tellart Future of International Travel Visitors enter the Museum through the Future of International Travel. Tellart Education Interactives The Future of Education showed multiple examples of interactive experiences, including a sand table and plant simulation. Tellart Future of Education The augmented sand table lets students explore topography, weather, and flow principles in a hands-on, tactile experience. Tellart Flora Design Game Government Summit attendees, acting as students, designed 3D plants based on genetic properties, which then competed in a simulated environment. Tellart Flora Design Game Successful plant designs were turned into 3D printed samples from bio-printers help students understand their creations. Tellart Future of Healthcare The Home Healthcare sinks use biometric sensing to identify family members, and provide a daily health report and recommendations. Tellart Future of Healthcare Artifacts from the Future of Healthcare, such as these Smart Dates, were shown in augmented display cases to explain their properties and usage.The Smart Dates are a manifestation of a home food dispensing system that intelligently adds customised nutrition and vitamin supplements to your daily meals, boosting immunity and well-being. Tellart Smart Cities After ascending in a (simulated) elevator, attendees looked over the city with overlays of the future government services. Tellart Digital Public Services The personalized public services attendant, presented as a digital hologram, captures your input and tracks your government service needs. Tellart Museum of Future Government Services At the exit to the Museum, visitors could explore hands-on technology demonstrations of drones, telerobotics, and more. Tellart was asked to design and direct an exhibition that would explore and inspire the future of government services in the United Arab Emirates. 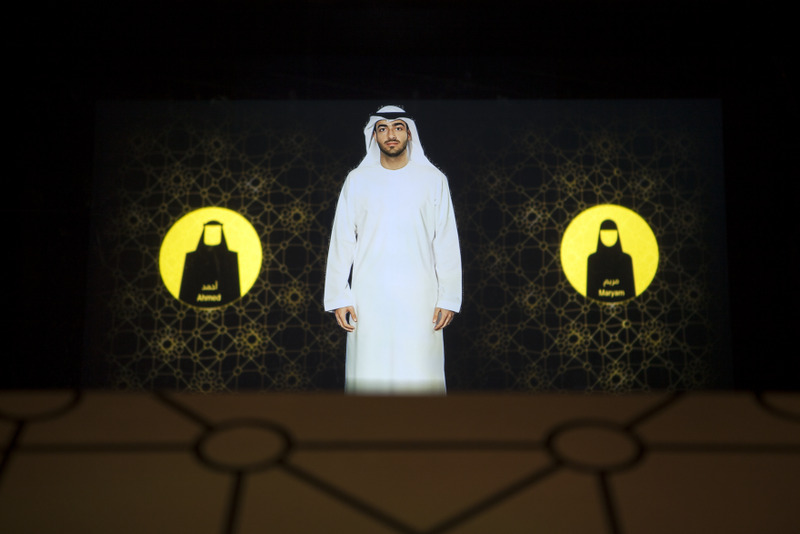 The output of the project would be displayed at the 2014 Government Summit in Dubai, a gathering of thousands of leaders from the Middle East. Beyond the challenge of envisioning, designing, and demonstrating the future, the project constraints included a short timeline and very high expectations for polish. The first challenge of the project was to establish a realistic, achievable, positive vision of the future of government services. We worked closely with the UAE Prime Minister's Office to understand their present system, and engaged experts such as the Institute for the Future, Fabrica and Dan Hill, Superflux and Near Future Laboratory to work with us on developing a portrait of the near future possibilities for government services. Using that portrait, Tellart conceptualized, designed and crafted the Museum of Future Government Services, working closely with Fabrica as a partner in concept, design, development and fabrication. We believe that the best way to understand a new service or product is to experience it. Rather than just telling or showing attendees the future of government services, our approach centered on creation of prototypes that could be handled and experienced by Government Summit attendees as if they were the citizens in this future government. By allowing government leaders to come face to face with the benefits and nuances of this future vision, it became a tangible possibility and strong stimulation for innovation. Each of the five major themes of the Museum was embodied in one or more interactives that showcased the possibilities of these services in an immersive, hands-on way. In the Future of International Travel, big data, intelligent sensors and better coordination will transform international travel. The experience of entering a country can be tedious, and subject to long lines and lengthy processing. This exhibit portrays a future immigration control experience, where the hospitality that the U.A.E. is famous for can come through. 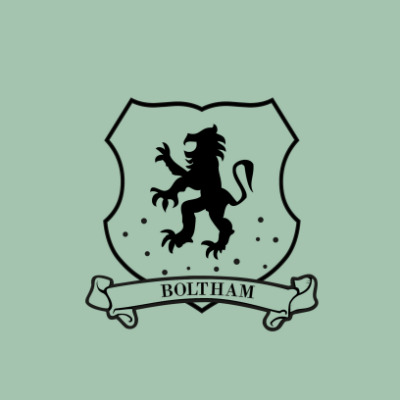 As this is the first experience of the museum, attendees are greeted with a cold hand towel for their comfort, a welcoming gesture typically found at luxury hotels in the region. As they cleanse their hands, they proceed in small groups down the immigration corridor where biometric scanners unobtrusively run identification and background checks. 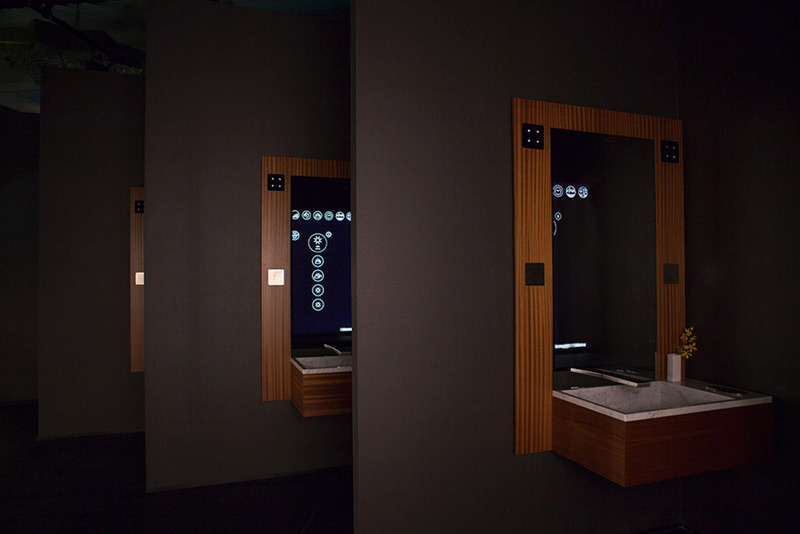 The experience is simple, and even beautiful–a stylized reflection of yourself is presented as you walk past, subtly registering that the system is working without interrupting conversation. 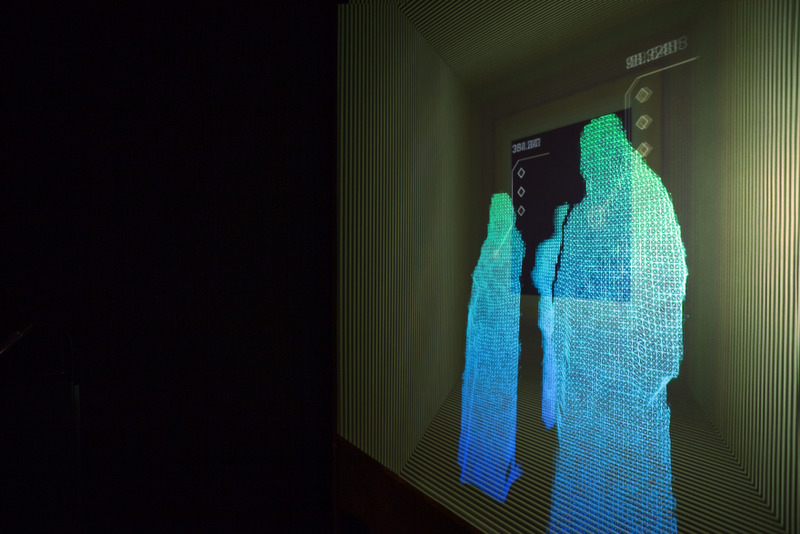 Rather than an intrusive health check, at the end of the immigration corridor, visitors hand back the cool towel to an official who scans the towel to check for communicable diseases as they welcome each visitor into the next exhibit. Today, most of the world's healthcare can be described as 'treatment-oriented'. As technology progresses and our lives become more quantified and analyzed, opportunities will open to address healthcare issues before they have occurred, and integrate preventative healthcare into our everyday lives. Instead of going to the clinic, healthcare will happen in your home. It will not only become more data-driven, but also more holistic. Mental and social wellness will become a part of everyday life. Wearable and smart devices will provide instant feedback and recommendations to inform people and encourage lifestyle changes that can have a profound effect across society at large. 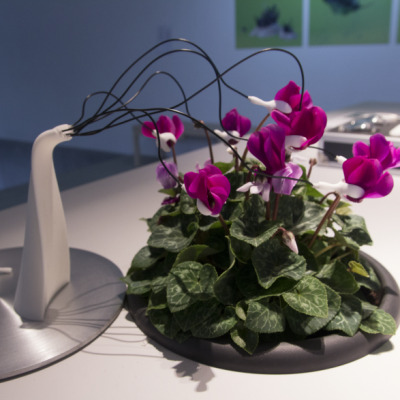 These principles were showcased in the exhibition using the Smart Sink. Family members are identified via biometric identification, and a daily scan of your body is analyzed alongside a snapshot of the data. All of this is appended to your digital healthcare records to provide a highly tailored picture of your wellness needs. 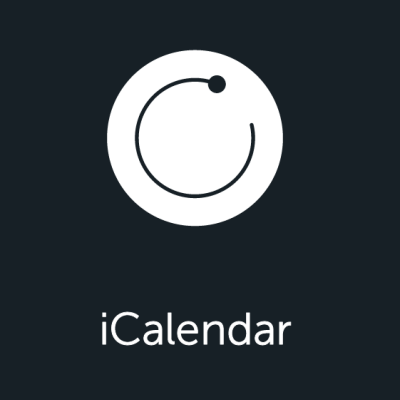 Integration with other personal information, such as your schedule for the day, and other environmental data, such as the weather and pollen count, enable the system to nudge you towards lifestyle changes that work for you. Algorithms and telephysicians will provide specialized input to manage and treat existing health conditions, while preventive care will be integrated into your daily meals and social activities. 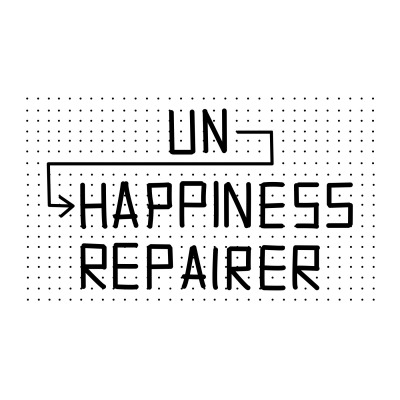 Individuals, family and public health will become integrated into a full system of health and wellness, helping to build health and happy societies around the world. Smart Dates are a manifestation of a home food dispensing system that intelligently adds customized nutrition and vitamin supplements to your daily meals, boosting immunity and well-being. Nano Toothbrush dispenses toothpaste containing thousands of microscopic "Nanobots" that are highly effective at cleaning below the gum-line, but also report gum health data back to the toothbrush. Smart Forkmonitors and collates the nutritional intake of your food with every bite, and helps you stay on track with your diet, monitor your insulin levels, and avoid contamination. 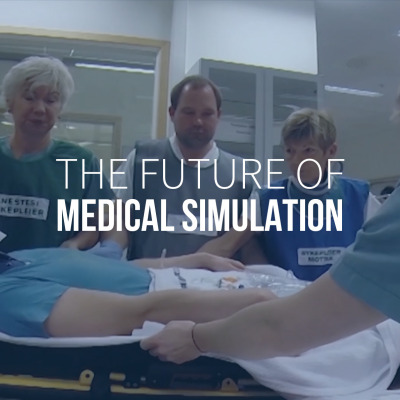 In the Future of Education, two exhibits highlight how social gaming, experiential learning, and simulation will help students explore their interests, refine their skills, and develop their own path in life. The Learning Sandbox experience depicts how future generations could benefit from hands-on simulations of subjects like geography, physics, and meteorology. 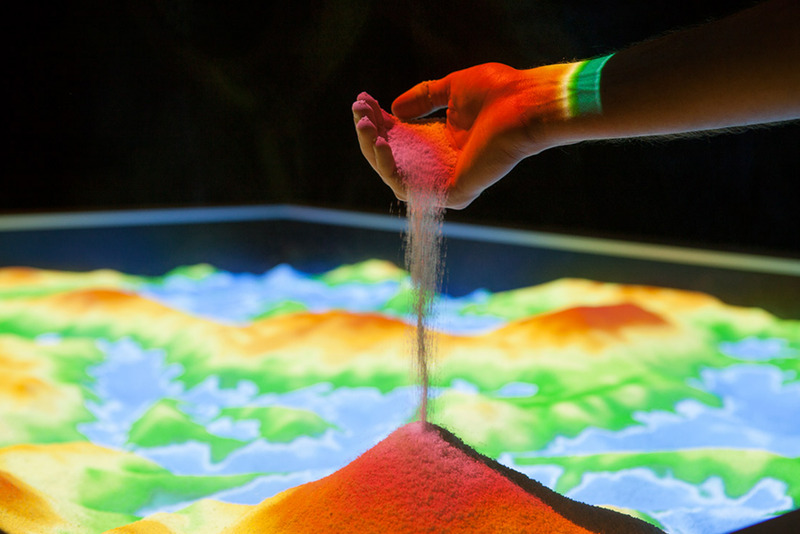 Visitors use a large interactive sandbox to visualize how weather patterns develop, how water flows, and more. By moving sand with their hands, students are able to receive direct feedback on the laws of nature through experience and interaction. The Flora Design Game depicts how students could collaborate and compete with each other through game-like interactions to learn about more complex subjects. Using synthetic biology and advanced genetics, students design their own plants to compete in a simulated desert environment. The strongest (or fastest, or most resilient) plants survive, teaching important lessons about ecology, biology, and complex systems. Government Summit attendees act as students and design their own plant using a tablet; each player customizes their plant using simplified controls, and sends it to the common simulation to compete. 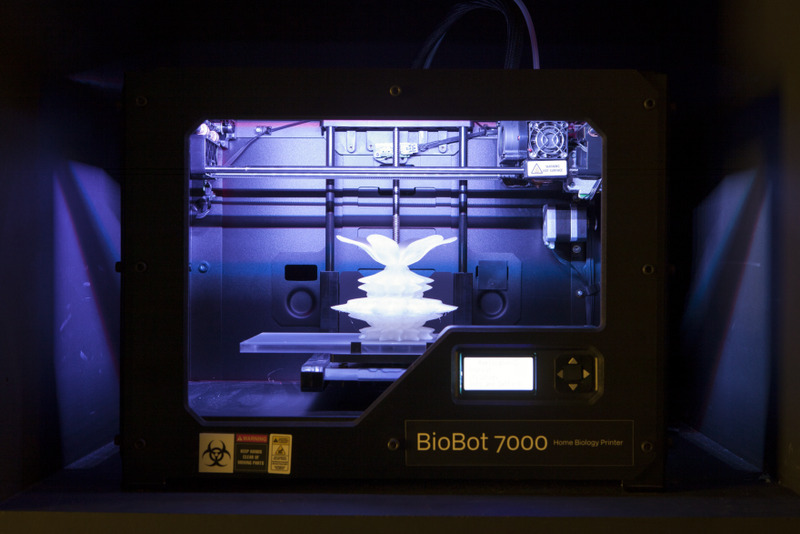 To showcase how future learning will go beyond the classroom, successful plants are submitted to 3D bio-printers that help students understand their creations and showcase award-winning work. 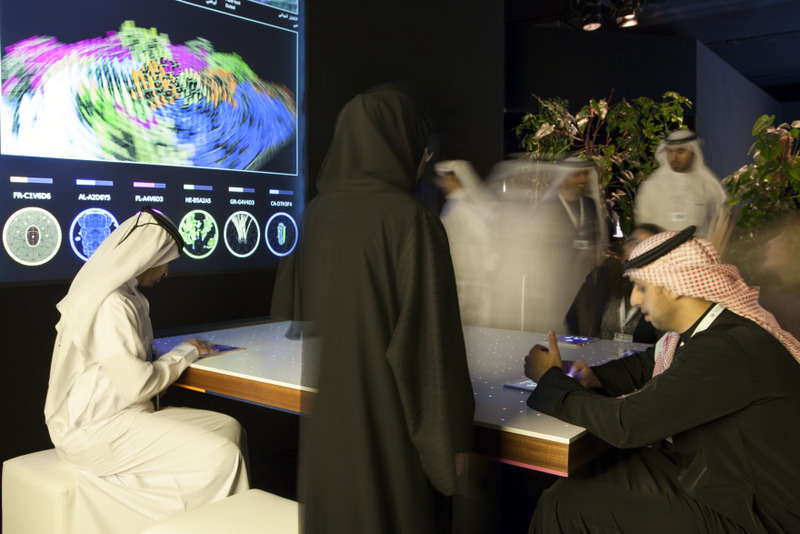 In the Smart City exhibit, Government Summit attendees explore a comprehensive view of the Dubai of the future. They are invited to ascend to the 110th floor of a future building in Dubai where they can overlook the smart city of the future. Overlays on the night scene of Dubai showcase the integrated sensors, advanced services, and intelligent systems that are embedded throughout the city, augmenting some existing services, and defining entirely new ones. The content includes explanations of smart electrical grids that will channel power in real-time from a network of distributed, clean sources to areas that need it the most; automated vehicles that will transport people and goods safely and efficiently, relieving traffic and freeing up time to focus on friends, family or work; and perceptive devices that will help you explore the city, discover new business opportunities, and enjoy time with the people you care about, doing the things you care about most. The Digital Public Services exhibit explores how virtualization, automation and artificial intelligence will streamline and empower public services around the world. Ubiquitous software helpers will act as "virtual personal assistants", eliminating paperwork and connecting citizens to the services they need, when they need them. These "genies" will be available to every citizen on their smart devices and will become the most common way for people to interact with their governments. The project incorporated a wealth of technology and approaches. We used high-end fabrication methods, custom metalwork and furniture, and handcrafted glassworks. Laser cutting, 3D printing, and CNC milling were juxtaposed with woodworking, glass blowing, and traditional model making. Audio-visual needs were met using screens, projectors, mapping, sound design and engineering, and we incorporated sensing methods that were camera-based, infared, and used capacitive touch. 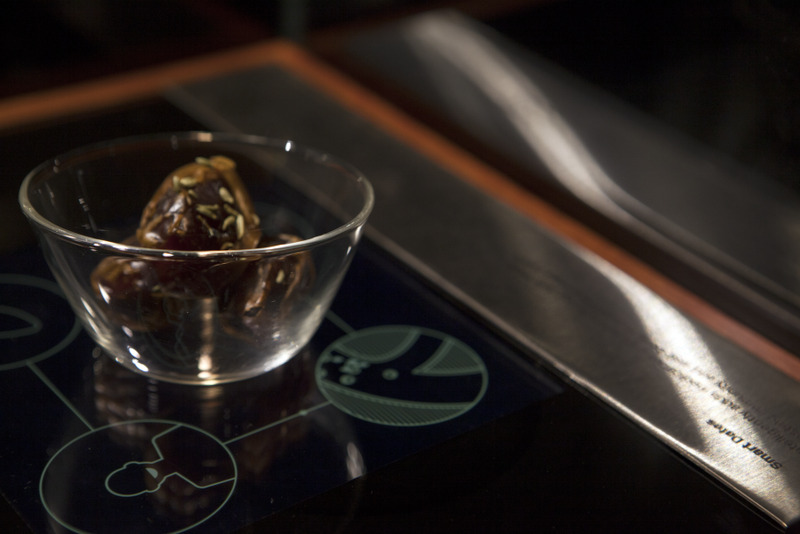 The museum incorporated graphic design, video production, including holographic and green screen work, leap motion hand control, connect based control, C++, Open Frameworks, and Java development. We used drones and LED lighting technologies. It was an extensive exploration of the available technologies combined with traditional, high-quality manufacturing and craft, all woven together in ways that point towards and illuminate the potentials of tomorrow. 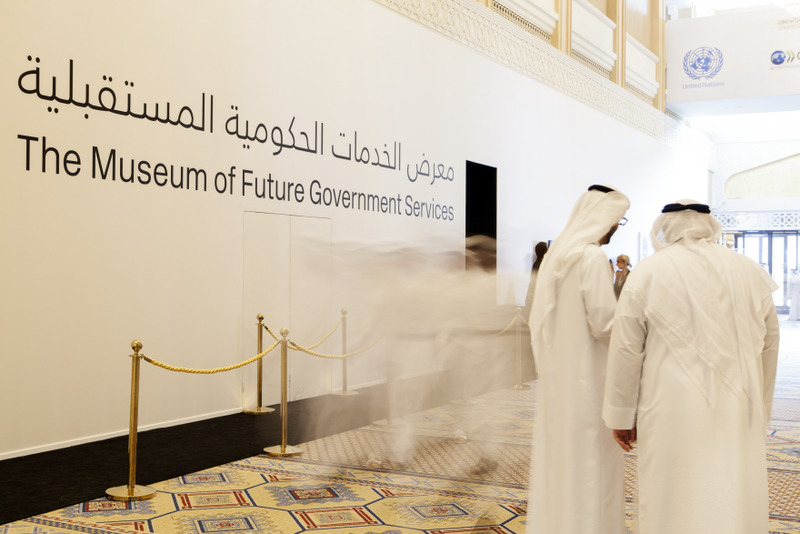 The Museum of Future Government Services has been visited by representatives from all over the Middle East and the world. There has been huge tangible interest in the exhibit, both in terms of implementation of particular services suggested by the exhibits, and in using the process of museum as idea generator. Besides the government programs directly inspired by the exhibition (the Drones for Good award), the exhibition also led to the planning and design of a permanent Museum of the Future, meant to be a permanent space where similar future prototypes of government services will be designed, prototyped, and demonstrated for visitors. A great thing about this project was that it involved a number of designers. The concept of the project itself was directed by one company, but within the speculative space a number of designers have been represented. It was a collaborative future space which plants it quite firmly in the world of professional practice and speculative design. This was a unanimous decision. This goes back to the idea of projects that are speculative and do deal with the imagination, but also have real world implications. This to us was a super exciting kind of avenue for where speculative design can really make an impact on the world.